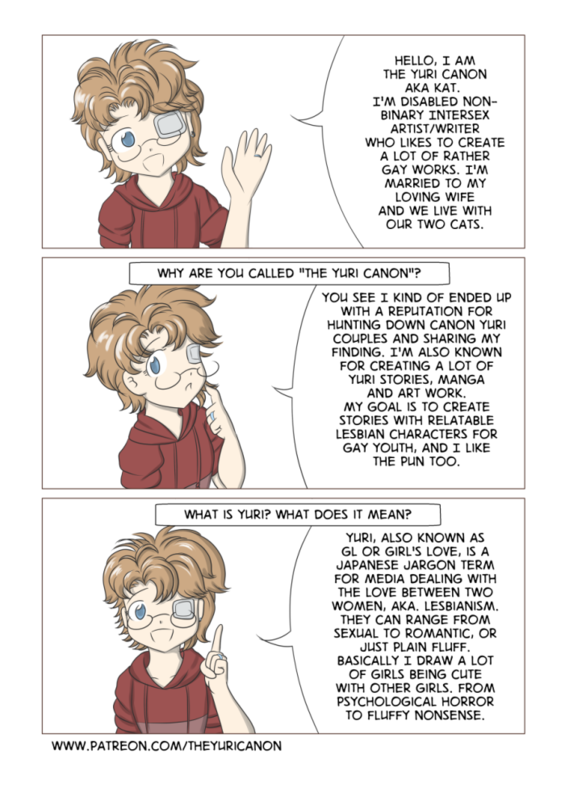 I am a disabled non-binary IS, lesbian, artist and writer who mainly focuses on creating my yuri webcomic Inside OuT. Over the past few years my health as declined more and more, adding on to the mental issues that I already battled with. PTSD, Anxiety & depression to name the major ones. I was declared disabled and unfit for the work world when I was 16, but I continued to work on my art and writer. As my health worsened It soon became apparent that I couldn't travel to conventions or film festivals anymore. Back in 2015 I was told by doctor's that I had an odd case of Hypothyroidism and sunk even further into depression. With the help of my readers, and my guildies in Guild Wars 2, I was able to pull through a lot of it, and try to face things again. 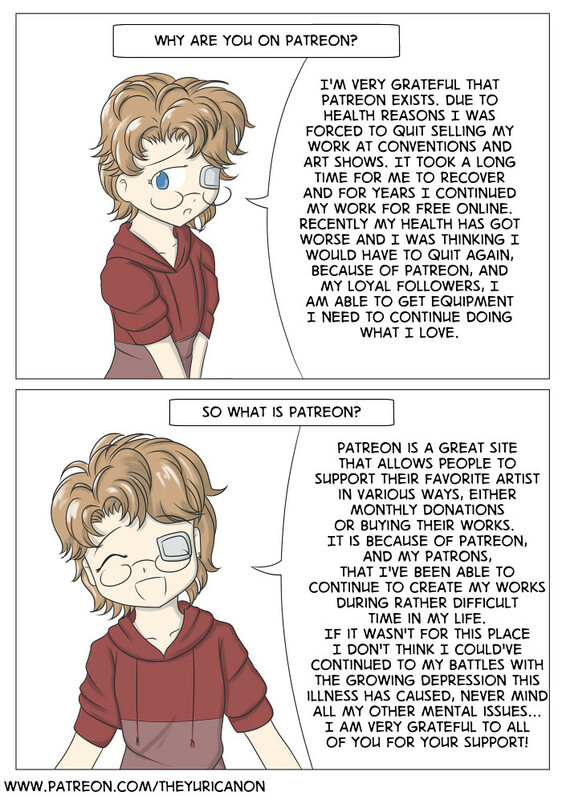 I decided to try Patreon and through your help I'm able to pay off our bills and buy new programs that make my work easier and less of a struggle. Thank you and here is looking forward to a productive 2019! 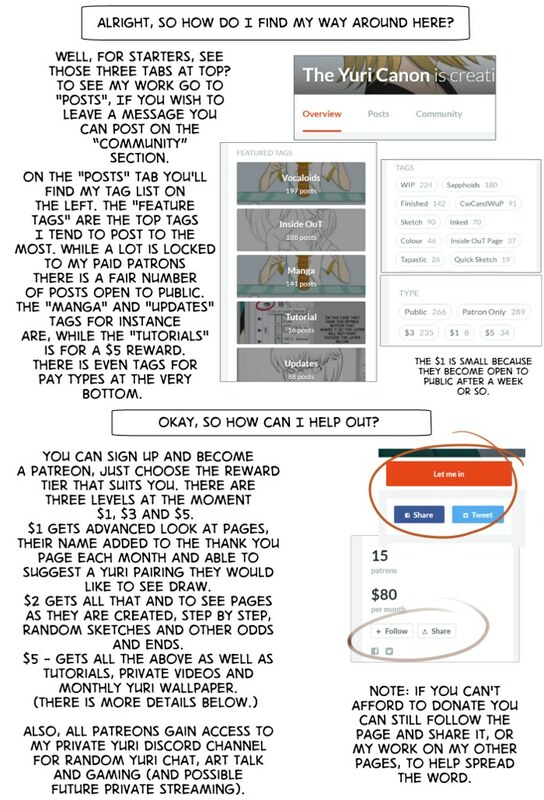 Here is a little manga I put together explaining just what i'm doing here. Firstly is my 10 year old Original Yuri Manga series Inside OuT , currently up to 500+ pages long as I work my way through Vol 4 of this rather complicated story about gender identity, sexuality, love, loss and the struggles of homework. 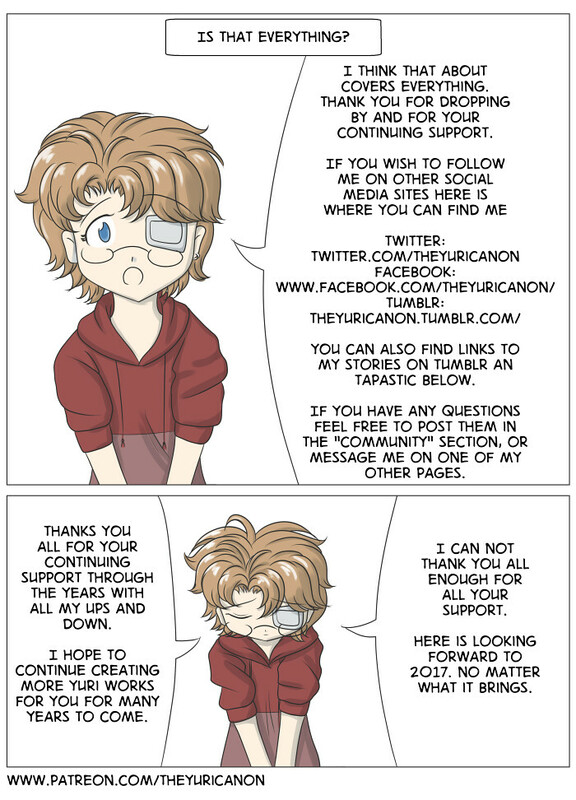 The entire story has been re-edited and posted on Tapastic for easy viewing on Mobile. Recently started a Side story from the same world, A Trans Tale, focusing on young trans girls struggling to find themselves. Sapphoids (AKA Clockwork Clown and the Wind-up Princess) ON HOLD- What started out as a silly short idea to help me through my recent illness, and me trying to combat all the “bury your gay” that appears in far too many Vocaloids songs, ended up turned into something much bigger and continues to grow. Follow the weird tale of Hatsune Miku, Kagamine Rin and Gumi as they explore the weird world of the Vocaloids universe. Read from the Beginning as well. Random Acts of Katness (restarted) - Series of shorts about my gay life, from life with my wife to gaming and dealing with mental illness and gender identity. Mostly random silliness. Dreaming of Another Day- The story of my high school years and my struggles with getting out of a mental hospital and starting my life over again. Rather harsh and dark, but many suicidal LGBT youth have stated it helped them cope with their own problems so I leave it online for for them to read when needed. A Shadowlander's Dream - Based on my first manga from '97 - '03. After being told I needed to quit self publishing due to my health and crashing so bad I couldn't draw for several years I decided to convert the entire manga into a series of novels. The series is a dark psychological yuri story that deals with a lot of my nightmares from the past so deals heavily with suicide, child abuse, mental health and many other issues. Morbid Tales of Macabre Curiosity and Deranged Love - A dark Victorian horror that my wife and I had fun putting together. For more about my many LGBT and yuri projects check my newly created website. Aside from knowing you are helping me continue in my work the rewards depend on what Tier you choose. 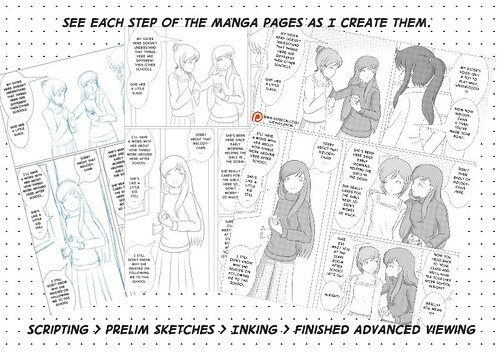 $3♥♥ Step by Step progress posts from Prelim sketches, Inking, Toning and text and scripting. So you'll get to see things before anyone else does. Plus a peek at my other projects and plans for the future. 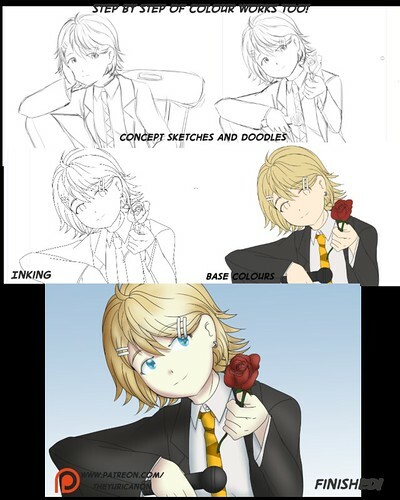 $10 ♥♥ Private Video art lessons and request a sketch. $20 ♥♥ I can't believe people are supporting me this much. I created 3 openings to get chibi colour character of your choice from one of my OCs or Fanart. Only 3 a month. My Primary purpose is to create as much LGBTQ+ as possible. From sweeties moments to the more sensual (all sfw). Here are My goal for the next while. ♥♥To create stories that lesbian, trans, Non-binary, asexual and Disabled youth can relate to. ♥♥Create 1 Inside OuT comic page or more a week (4+ pages a month depending on how my hands are doing). - More of A Trans Tale when I have the time and Random Acts when I have the time. 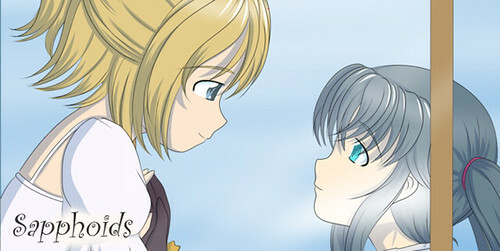 ♥♥One full yuri wallpaper (will post a Zip of different sizes each month) I have a suggestions post for $5 Patreons. ♥♥WIP of how I put this all together. Basically a lot of sketches, planning and me talking through the steps of stories and plans. ♥♥Post tutorials, art videos, personal videos and more. If people have questions or suggestions on what they would like a video about feel free to ask. Well, thanks those of you who have been supporting me over the years. Ever little bit helps a lot. Here is looking forward to many more years of LGBTQ+ content. help pay bills and save up to finally be able to move out of this horrible apartment.